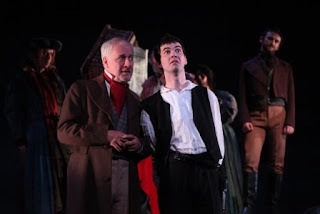 Last week all our V form went to the Helix Theatre to see Hamlet (their single text choice for the Leaving Cert in 2011) in a Second Age production. This was one of the most effective schools' productions we've seen from Second Age, being pacy right from the start, and with mostly strong central performances. The considerable rake emphasised an intimacy with the characters, and Marty Rea delivered the famous soliloquies with intelligence. Stephen Brennan as Polonius, Garret Keogh as Claudius, and Barbara Brennan as Gertrude also delivered. Read here Emer O'Kelly's review in the Irish Independent, and Peter Crawley's in the Irish Times here: both are positive about the production.